Ron Sirchie has been building an impressive repertoire of healing skills since 1991 when he became a Licensed massage therapist. Practicing massage at some of Atlantic City's finest casino spas including: Trump Plaza, Showboat in early 90's and then recruited by Philadelphia's renowned Bellevue Hotel where he worked his way up the ranks to head male therapist within 1 yr. Moving onward and upward joining the well respected team at Toppers Spa in Philadelphia in 96', again rising to head male therapist. In 97' Ron studied traditional Usui Reiki which opened him to a level of Indigo consciousness. Leaving Toppers in 2000 in suit of metaphysical training and studying with some of today's greatest Spiritual teachers such as Drunvalo, Gregg Bradden, Tom Kenyon, Alex Grey, Dr. Ramesh and many other leading metaphysical thinkers of today. Ron became one of Drunvalo Melchizedek's youngest facilitators for the FLOWER OF LIFE program, facilitating 48 meditation workshops. In the Summer o3' Ron found himself @ the new Borgata Spa in Atlantic City allowing him to mix w/a high level of therapist. Shortly after Ron took a job @ Philadelphia's premier day spa, voted best of Philly for the past 7 yrs. Rescue @ Rittenhouse. Today Ron is only seeing clients in his private studio, located in the Society Hill area of Philadelphia. Approximately 20,000 clients later, Ron Sirchie shares an insight that surpasses most in his field. The energy of the "healing arts," is easily felt during a session with Ron, who specializes in deep tissue, cranial release combined w/energy work. In 2011 Ron continued his education with Drunvalo and his now a teacher for the SCHOOL OF REMEMBERING, facilitating "Awakening The Illuminated Heart," meditation workshops. Ron is a graduate of Philadelphia's Massage Arts and Science Center. He completed courses n the teachings of Marty Redien (U.S. Olympic massage team) for Advanced massage modalities, Hot Stone application, Deep Tissue massage, Reflexology, Hydrotherapy, Aromatherapy, Rain Drop and his forte', "cranial sacral." Ron has excelled in many energetic modalities such as Feng Shui, Tachyon technologies, the use of magnets, Reiki and applied sacred geometry also Shamanic healing. In becoming a Flower Of Life facilitator back in 02', Ron held 48 workshops assisting people in the Mental MerKaBa activation but now is focused only on "The Awakening The Illuminated Heart," process of Heart MerKaBa activation and Unity Living. 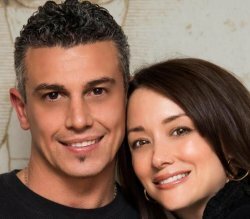 Ron is a husband to Shannon Winter Sirchie, one of Philadelphia's top make-up artist, nutritionist and regression therapist. Together they have two beautiful girls for which give them a strong family union. His entire family is very active with Drunvalo's meditations and teachings. Shannon who is a success story herself adds many levels to the workshops during lunch and off hours, providing participants knowledge on nutrition and food. This was great. This teacher is a wealth of knowledge, resources, and love. It is very welcoming. Perfect one for your first workshop. There is a deep immersion into this meditative state while you are there and when you come back home, ironically, is when you will question what is real. It helps if you already know of this work but it also definitely works on a subconscious level as well. I cannot recommend this enough, even to go two or three times. He is definitely one of those that know what they are talking about. This is something that you must apply to see serious results though, you must believe. Don't let stress affect your state of being. There is a balance. We all have infinite power but the ones who use it are the ones who are aware of it. Awareness of awareness is key. You can be anything at any given moment no matter what if you are aware of it. Words are inadequate to describe the deep and profound shift I experienced in the very core of my being. Love and gratitude are the lingering take-aways from this life-changing workshop. Amazing. Astounding. So happy to have been a part of it. Thank you all who made it possible. Eternally thankful. Excellent teacher. Ron is a clear communicator, has a depth of knowledge, and a generous/caring approach to his interactions with his students. His guided meditation with music CD has been invaluable to me as an aid to my meditations at home after the workshop. I dont think I would be as successful with my meditations without the CD. I met Ron 8 years ago at a Living in the Heart workshop and I made sure to take the latest workshop with him.